Did you know that Tungsten Carbide is the most scratch resistant metal known to man? Tungsten rings are quick and easy to remove from your finger in case of medical emergency, easier than gold. • Timeproof - Good be used as a family heirloom. And the good thing is, after years, it's as good as the first time you wore it. • Premium customer service available to assist you with anything. "I'm very impressed!! Great ring, fits perfect, and hasn't scratched at all! Shipping only took about 3 weeks-thought it might take longer, but it was definitely worth the wait!! Will be ordering another ring shortly. Don't be hesitant, you'll be glad you ordered yours now!!" "Love the new ring very well made and feels like it will last for ever thank you so much Friends of Irony"
"It fits perfectly and I love it. I have gotten several compliments at work from co-workers. I highly recommend it for purchase." Why wait? Be one of them. Get yours now! PEACE OF MIND: You're covered by our 30 Day satisfaction guarantee. 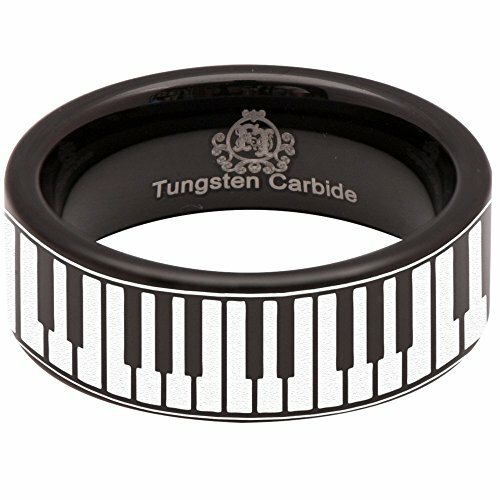 Love our Piano Keys Ring in 30 days, or get your money back. No questions asked. If you have any questions about this product by Friends of Irony, contact us by completing and submitting the form below. If you are looking for a specif part number, please include it with your message.